This is the irony. When you are trying to lose weight, you think about food all the time. More than if you weren't on a diet. 9AM - Wake up. I mean, I've been up already at 7AM to walk the dog and feed her. Then I went back to sleep, and it was so good. Sleep is amazing. 9:15AM - Negotiate going out to breakfast with Matt. He isn't a big "go out" for breakfast, and I love it. It's a luxury to me. I usually get bargained down to lunch. He agrees we can get breakfast, provided it isn't crowded*. We both get ready. 9:20AM - Scale is not favoring me. I am up a quarter pound from the day before. I hate that. But I've been stuck at home for two days, and in that time, I've had frozen pizza for two meals. I need to get it together. I reason that once all the fiber I've been eating leaves my system, I should be in good shape. 10AM Walk out the door and start de-icing the car. 10:45AM - It takes 45 minutes to de-ice it. Had I been in charge, it would have been less, I think - but what do I know? So, of course, now breakfast is basically a non-starter. Neither of us has eaten, so we head to lunch. 11:12AM - Lunch - BBQ. I order unsweet tea, a brisket sandwich, slaw and in a last minute move, mac and cheese. I also eat both little cheese biscuits that are placed in front of me. I end up not eating the bread from the sandwich, but of course, I ate all of the mac and cheese. It wasn't a huge portion, but it was still reeeeaaaaaally unhealthy. I don't feel bad or guilty. I do feel guilty about eyeballing the dessert menu and realizing they have coconut creme pie. There was a restaurant in my hometown that used to make the best creme pies in the world. Strawberry and Coconut were the very best. They also had the best mac and cheese ever. And breakfast. It closed about ten years ago, and I still miss it. 11:45AM - Gas at Costco, then head to the VW dealership. Matt is car shopping, and Sundays are best for walking the lot, but since they're closed, you can browse cars unhassled. 12:15PM - Same drill at the Honda dealership. 12:45PM - Aldi. I love grocery shopping, but my better half thinks it's a form of torture, so I don't get to peruse at my leisure. But I do get some meat, vegetables, and dishwasher detergent. I eyeball cookies, chocolate and pastries, but honestly, I'm full, so nothing looks top notch. 1:40PM - Arrive home, unload the groceries and leave for Kroger/Walgreens. 2:13PM - Detour at Sonic. I need a Coke Zero, and add cherry. Not diet cherry, either. It probably added 100 calories, and obviously it's not exactly sugar free, but I did it, and I sucked it down and it was marvelous. 2:20PM - Walgreens. I stand there, patiently waiting for them to assist me. I got two of my four meds, which is better than nothing. Sort of. I throw them in a handbasket then do the rest of my shopping. I end up with a handful of cards - although, I somehow didn't get the birthday card I actually needed. Whatever. I got some body wash for Matt, and some hair paste for me. I walk down the snack aisle and look at the brownie brittle for a while. I walk down the Valentine's Day aisle and look at the big heart shaped boxes and think about how much I love boxed candy. I check out without any candy. 2:50PM - Kroger. The flower department is disappointing, and I think maybe I'll go to Trader Joe's tomorrow. I quickly hit the aisle that has baking stuff on it because I am thinking about Bisquick. The "heart smart" type is only 20 calories less than the regular stuff. I don't buy any of it. I do buy some generic Shake n Bake, because I can make a faux chicken parm, and that idea sounds awesome. I continue down the aisle and stop at a "cake for 2" kit - strawberry. They also have lemon, and chocolate... I pick up a box of "No Pudge Fudge" brownie mix that you make with a carton of vanilla yogurt. I had these years ago, and they're gritty and nasty. I put the box back. I pick up the bran muffin mix. Fourteen grams of sugar. I put that back. Get the pharmacy stuff I need (Kroger has some things cheaper), then head to the checkout. I go past the Valentine's stuff, and I think again about how much I love a good Whitman sampler. 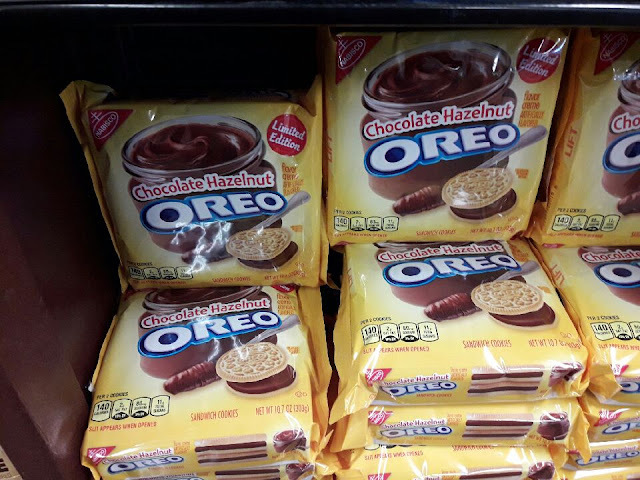 I see some Nutella Oreos on the endcap. Technically, they're Hazelnut Chocolate, but we all know that the intention here is Nutella. I mean, damn. 3:00PM - As I am leaving, I notice a pile of angel food cakes at the door. They look good. I duck back in to see if this Kroger has the sumo oranges I like. They don't. I leave. The problem with the angel food cake is that I could eat a whole one by myself in an evening. I'm not proud of that. 3:05PM - Gas station. I stop here to pick up a lottery ticket that I'm giving to someone as a gift. I look over at the Little Debbie display, and then at the cheap candy on a clearance shelf. I decide it's not worth it. 3:36PM - Unload groceries, and talk with Matt about cars as we watch American Horror Story Asylum. I get up occasionally to change out laundry, walk the dog, unload the dishwasher. 5:30PM - Matt isn't hungry yet, but I am. I cut an Opal apple and mix some water into a few tablespoons of peanut butter powder. The apple is good, the peanut butter-like paste is passable. I finish this off with a small handful of unsalted nuts. 6:45PM - Matt is hungry. We decide on spaghetti. This is not as terrible as it sounds. Lean ground beef, tons of veggies, an organic jarred sauce. I eat mine over riced cauliflower, so it's even better for me. It's a healthy-ish, filling meal. I do eat two garlic knots, but that's better than pasta, so I'm good with it. Eat a few raspberries while I clean up dinner. 8:45PM - Blogging with a Diet Dr. Pepper. Yes, I realize I haven't had any water today. I'm still wishing I had dessert. Cake. Icing. I have the ingredients for icing in the house. I could have a bowl of it ready in 20 minutes. My jeans feel less tight than they did a week ago. I'm digesting and processing my food appropriately. I'm trying to put that delicately. Y'all don't need the details. But my knees hurt. My right knee in particular. I have no idea how I messed it up, but I did. So there's that. My hips hurt at night. I fell on the ice the other day, and I have a bruise on my gluteus maximus - well, I have a sore spot, so I assume there's a bruise, even if I can't see it. I know I'm getting older, but it's annoying to have knee pain. I need a massage. I would love to get one tomorrow, but that's not going to happen this week. So, you see, I'm constantly thinking, looking, procuring, analyzing, cooking, eating, cleaning up after, bargaining about, disappointed by, stressed out from: FOOD. Which is me managing my relationship with it, but sometimes, it feels like a really, really abusive relationship. Tomorrow, we are getting breakfast out before we run errands. I already know that I want pancakes. I always want pancakes. From Cracker Barrel. Bacon. Ice water. Coffee. Cream. Splenda. The question is... blueberry? Or plain? Or banana? Or... you get the idea. I like pancakes. That's my relationship with food. My lover, my frenemy. I'm almost a week into sugar detox. I feel like it's up and down. Today is not a good day. Tomorrow, if I do eat pancakes, that will derail the detox somewhat. There is nothing redeeming about pancakes. Or maple syrup. Just saying. I'm always just saying. So, my doctor wants me to change the way I think about food. Doing that has made me even crazier. There's not really a point here - I just wanted to tell people that maybe not all fat people, but this one, has an ongoing dialogue going on in her head about the almighty calorie. I should really use my brain more for better things. *Here is a fundamental difference between me and my husband. I love Cracker Barrel. I mean, love. And if I have to wait for a table, great! I can shop around a little, check out some toys, the jewelry, clothes, gifty things. Matt sees that as torture. See above in re: grocery shopping.